Our AweSome products will exceed your expectations for Quality, Usefulness and Value. An assembled and tested VT-2 Volume-Tone Control for projects that use our switch products (i.e., T2P-Switch, T2-Switch, T3Plus-Switch, T4-Switch, T4M-Switch). Special Update: Select controls now include Treble Bleed circuitry plus high quality polypropylene tone control capacitors (with a superior linear frequency response) for unequaled versatility. These upgrades give you "American Pro Stratocaster" performance from your stock guitars. One VT-2 Volume-Tone Control with labeled wires. 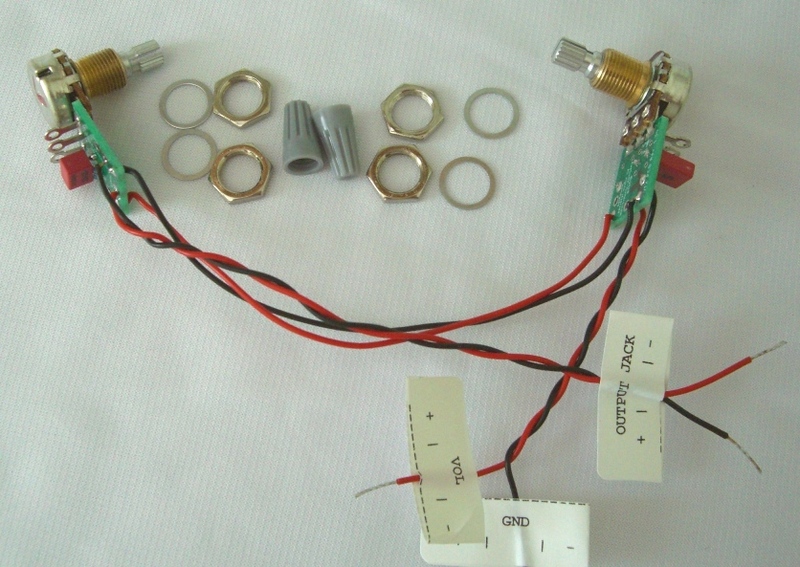 Includes two high quality Bourns 500K right-hand audio taper potentiometers, .047mfd capacitor, attaching nuts and flat washers.